Had a shed load of Pain Poilâne in Paris on the way down. As usual had mixed feelings about how good it is (compared to what you can make yourself) and it’s dominance of the world of French quality bread. 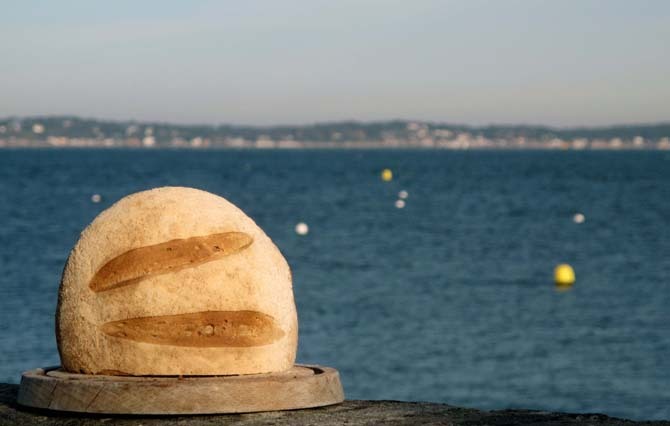 Seems crazy you can buy it (sliced) in Nice, or Arcachon for that matter, when there should be great local bakers producing their own style of bread. Not complaining though. Here we hopped down to the local bio deli and bought a big chunk of wholemeal from a loaf that must be three or four kilos from Pain de Belledonne (www.pain-belledonne.com). It claims to be 100% everything and I know I’m being picky but it just seems to be a little characterless and, I discovered, Belledonne is obviously a big company geared up to the organic market and their bread gets shipped over here from the other side of France. That’s fine but, again, where is the local baker? I was just about to say to myself, ‘Nutter!, imagine baking on holiday’ when I remembered that while visiting my aged folks in New Zealand a couple of weeks ago I scrabbled around finding ingredients and tools to bake a loaf for them (a variation on a rustic loaf in Hamelmann’s book). Oops, sorry Mick, this ISN’T a holiday – it’s work. Good luck with the writing, look forward to the book. Yes, it’s terribly hard work. Off to Bordeaux in the morning and whatever else happens it’s going to be lunch at La Tupina.